Experience: Aston Martin V8 Vantage. Along with a Perfect Matching Audemars Piguet Royal Oak Offshore Scuba Blue Boutique Edition. 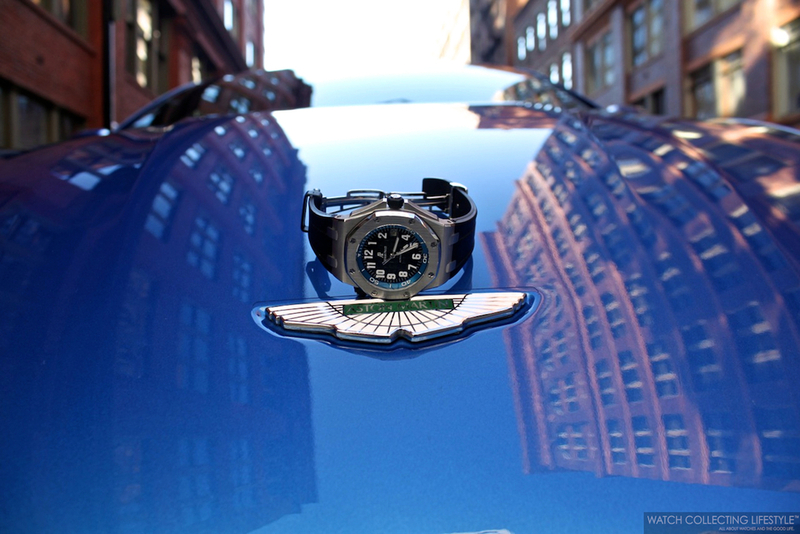 Our close friend and watchlifestyler Riley was taking his Aston Martin V8 Vantage for a ride when he realized that the blue flange on his Audemars Piguet Royal Oak Offshore Scuba Blue Boutique Edition ref. 15701ST.OO.D002CA.02 was an exact match to the color of his fancy automobile. Therefore, he decided to snap a few shots for us. Just like the Royal Oak Offshore continues to go through constant engineering and advancement, the Aston Martin Vantage has gone through 10 years of upgrades and engineering to be the high-performance iconic sports car it is today. Combining an instantly recognizable design with exceptional technology, the Aston Martin V8 Vantage embodies all that is great about Aston Martin, just like the Scuba on the hood. Powered by a lightweight and compact 4.7 liter engine, the V8 Vantage outputs 420 hp and gets you from 0-60mph in just 4.9 seconds. Not bad for such a large automobile. Opposed to what most people think, the interior of the V8 Vantage is very cozy and comfortable, not necessary what you expect from supercars or sportscars like this. The finest materials are used to create a driver and passenger environment of exquisite finesse, all created by expert craftsman. With hundreds of unique color and finish combinations available and a range of personalized options the V8 Vantage can be purchased exactly how you want it. History, exclusivity, refinement and sportiness are the words that come to mind when getting into one of these cars for a ride. Interestingly enough, these are the same four words that come to mind when strapping an Audemars Piguet Royal Oak Offshore Scuba Blue Boutique Edition to the wrist. For those of you wondering, the Scuba is quite rare as only 300 pieces of the blue edition were ever made. While the Aston Martin V8 Vantage is definitely not as rare, it is an automobile that you don't see as often on the streets. These last shots will make you feel like you are on the wheel wearing the Scuba and taking those tight corners as fast as you can. 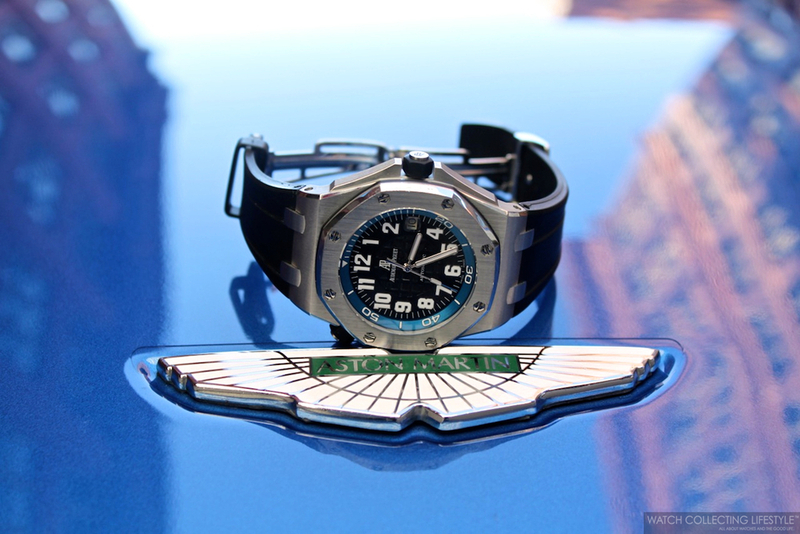 If you can still find an Audemars Piguet Royal Oak Offshore Scuba Blue Boutique Edition get it, just make sure you add an Aston Martin like this to match the blue flange on your timepiece —at the end of the day we watchlifestylers like to do crazy things like that when it comes to getting matching stuff to go with our watches and not the other way around. 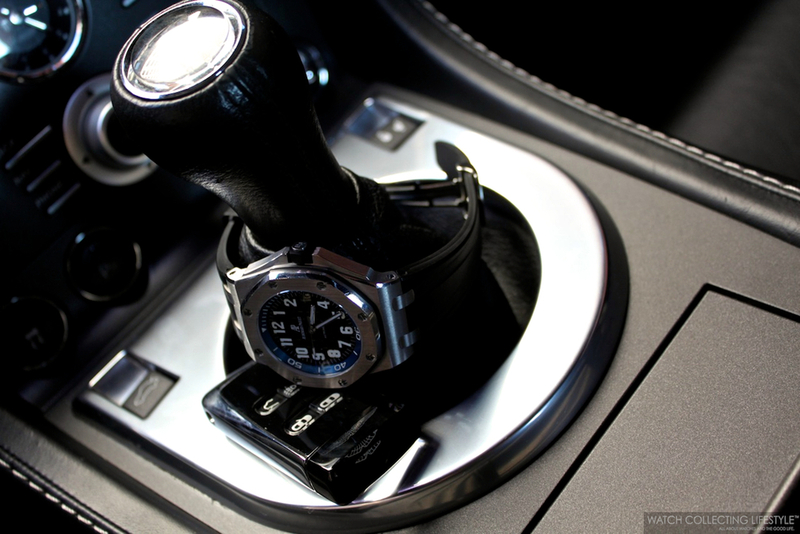 For more info on Aston Martin click here and on Audemars Piguet here. Posted on December 7, 2013 by Editor & Publisher and filed under Automobiles and tagged Aston Martin V8 Vantage Audemars Piguet Scuba Blue Diver Audemars Piguet Royal Oak Offshore Scuba Blue ref. 15701ST.OO.D002CA.02.